The project is located in Beekbergen that, much like most small towns in the Netherlands, is composed mainly of large single family houses that are not affordable for young people or suitable for older people with mobility problems. 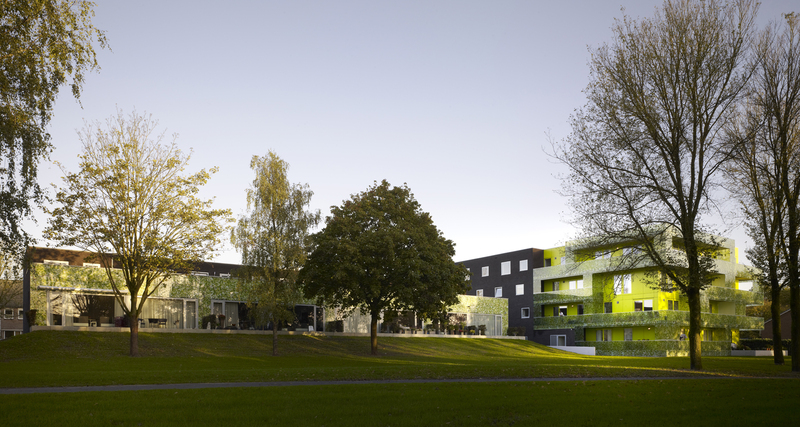 ‘Ginkgo’ project explores the possibilities of providing affordable housing for different target groups thanks to its compact housing complex, which is physically and visually integrated in its context. The site is an interesting space located between two zones with very different characters: a green park on one side and an urban, post-war neighborhood built in the 50’s on the other side. 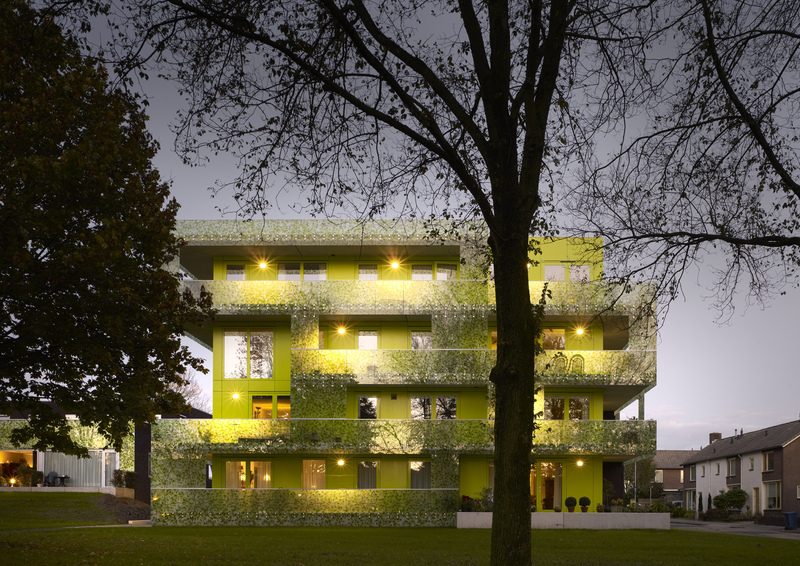 The transparency of the facade facing the park including the long balconies along the apartment block and generous terracing of the park-houses connect the dwellings visually and physically with the park. 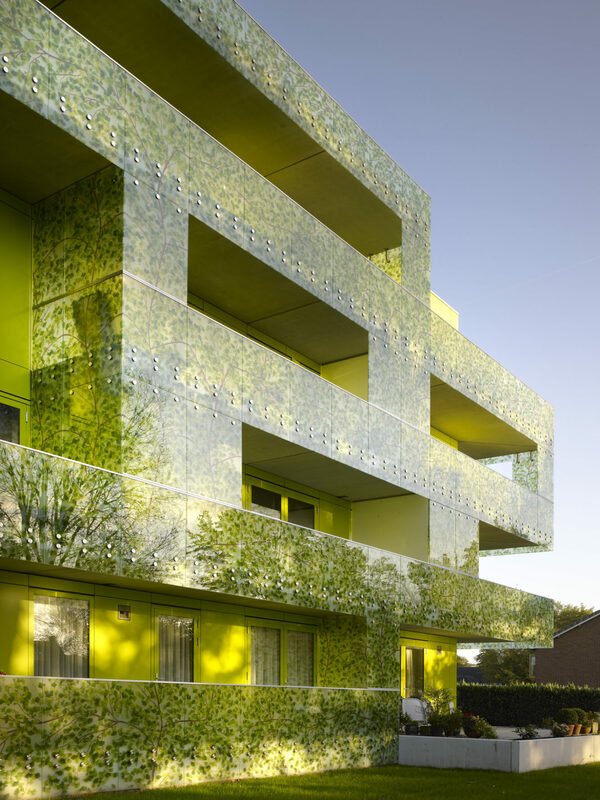 The glazed facade has been specially designed with a print of Ginkgo Biloba tree leaves of different green and yellow tones that react to the constant changing light of the sky creating very special effects, reflections, shadows and silhouettes, depending on the time of the day and the season of the year. 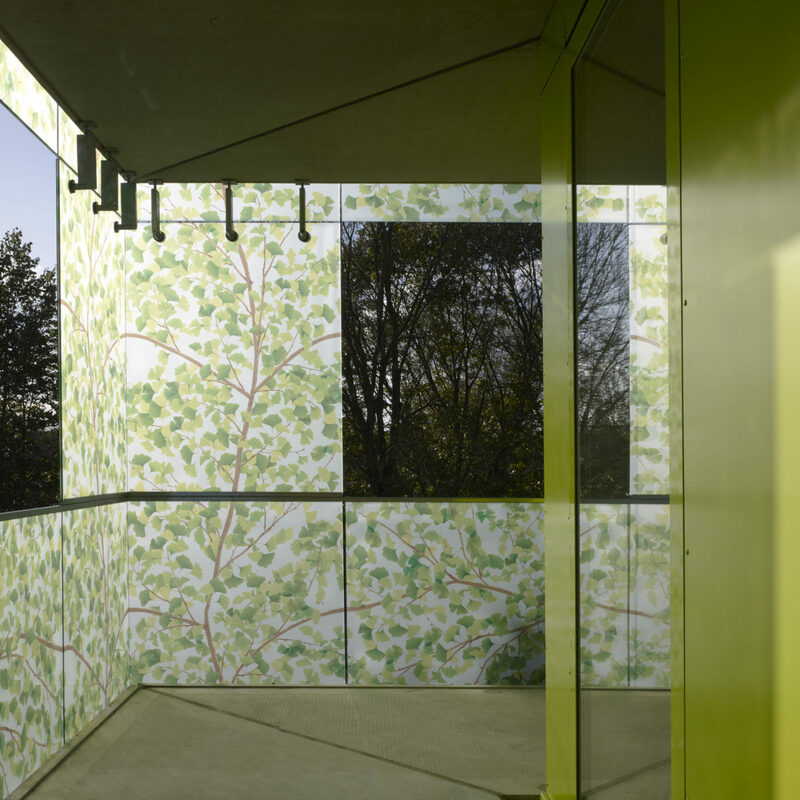 This enables privacy along the balconies and terraces, while ensuring visual connection between the outdoor spaces and the park. 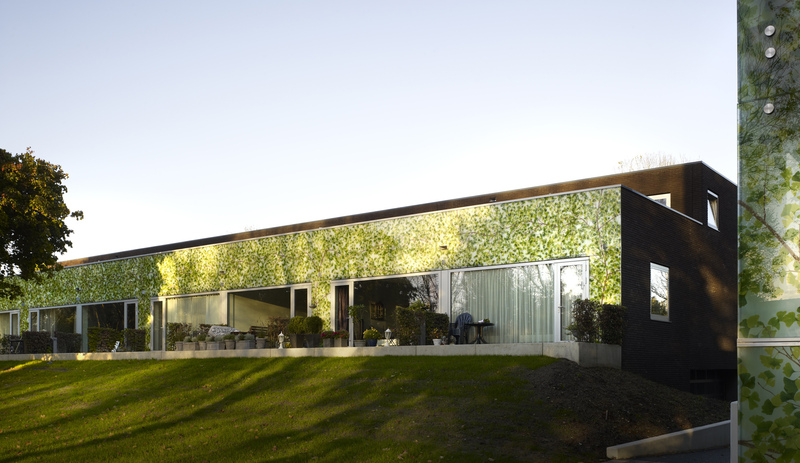 Almost each printed panel of the facade is unique in order to avoid visual repetition creating a natural and organic continuous image of vegetation that wraps across the whole facade. 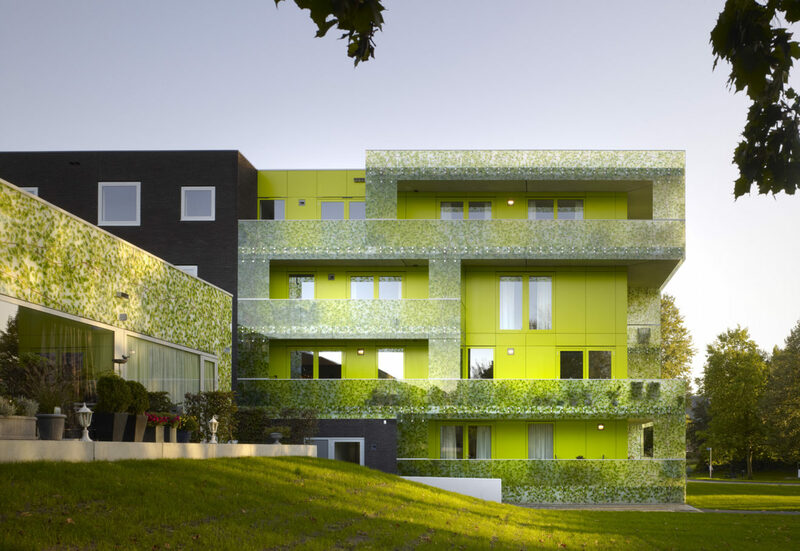 It works as a virtual green facade that integrates the building into the greenery of the park and reduces its visual impact in the surroundings, thus giving to the building an iconic image of lightness and immateriality. This skin wrapping the building along its front responds to the urban character of its context. The proportions of the openings of the facade and the use of brick that creates a more massive appearance to the building help the project to establish a subtle dialogue with the existing post-war buildings in the neighborhood. The vertical circulation core in the center of the block is surrounded by a first ring of collective circulation. The second ring concentrates all the required services of the apartments (toilets, bathrooms, kitchens, storage and installation shafts). The third ring is a flexible and continuous living space that can be divided in many ways to offer different layouts for different ways of living.